Sara “Sally” Staples (nee Matties) was born February 6, 1926 in Siberia, Russia. 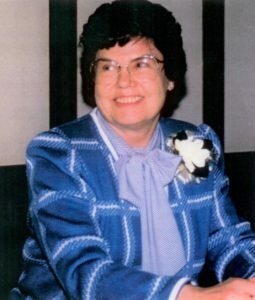 She attended primary school in Alberta and high school at the Sharon Mennonite Collegiate in Yarrow, BC, and graduated in 1953 from St. Paul’s Hospital in Vancouver. She married Willett (Bill) Staples November 7, 1953. 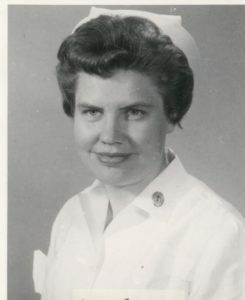 Sally started work at St. Paul’s in the medical ward in 1953, and subsequently held positions of increasing responsibility in which she contributed to changes and development in the quality of patient care. She helped plan and design the first Intensive and Coronary Care Unit in the province in 1966. Her development of the extended work day and the master rotation concept greatly influenced nursing in BC. She became Supervisor of Critical Care Areas and Senior Director of Nursing Operations from 1982 to 1986. She was also involved with labour relations and contract negotiations, participating on a number of committees. On her retirement July 1, 1986 she received the RNABC Award of Excellence in Nursing Administration. She describes her nursing philosophy: “To be a good nurse, first and foremost you must enjoy working with people. I see technology as a tool which enables the nurse to do a better job.” She died October 12, 2012. Fonds consists of 2 cm of records related to Sara Staples’ life and career, including her diploma, correspondence and articles. Of special note is a scrapbook, compiled following her retirement, and providing through photographs and textual records a perspective on many of the people who were central to the development of nursing and St Paul’s Hospital in the latter part of the last century.